Consumer awareness of smart technology is increasing, but many people still assume you have to pay for a smart meter to be installed. Utility Week investigates. Interest in smart technology is on the rise, and it is being driven, in part, by the uptake of smart meters. The results of a survey carried out by Harris Interactive on behalf of Utility Week reveal that smart meter ownership is driving interest in general smart technology. However, a lack of knowledge about, and the high cost of, smart and low-carbon technologies are increasingly becoming barriers to adoption. Of those who own a smart meter, seven in ten own a smart energy meter only. This is a slight increase on previous surveys carried out by Harris Interactive. Meanwhile, 18 per cent own both a smart energy and a smart water meter. And levels of interest in smart water meters are rising rapidly. Just under two-thirds (63 per cent) of those without a smart water meter would be interested in getting one, up from 46 per cent in June. The biggest drivers for getting a smart energy meter continues to be saving money and convenience. Meanwhile, the belief that having such a meter is “good for the environment” jumped in November’s survey and is now the third most important motivation for smart meter take-up. The main reason for not getting a smart meter continues to be the belief that it will not make a difference. A quarter of respondents list this as a reason. Other reservations are that they do not know enough about smart meters and issues with privacy. The importance of these two factors has risen since the previous survey was carried out. Interest in smart home technology has increased. A third (31 per cent) of respondents said they were either “extremely” or “very” interested, compared with 26 per cent who expressed interest when the previous survey was carried out in June. However, this figure is still less than the 43 per cent who said they were interested when the survey was carried out in November 2017. This interest appears to be being driven largely by uptake of smart meters, with more than half of respondents (52 per cent) who own a smart meter saying they are “interested” in smart technologies. This is quite a leap from the 39 per cent who answered “yes” to the same question in June. A whopping 79 per cent of 25 to 34-year-olds who have a smart meter said they were interested in smart tech. Meanwhile, just 31 per cent of those 55 years old and above said they were interested. This would suggest the cliché that millennials are more interested in technology and innovation is true. The smart energy devices asked about in the survey were Nest and Hive thermostats and smart meters. Among these, the main barriers to adoption are cost and perceived lack of need. Fear of the unknown is now also a significant barrier. For those who don’t have one of these devices, a decrease in price and, for smart meters especially, free installation, and savings would be the main factors that would encourage them to get one. The fact that the meter and installation is already free – albeit paid for via energy bills – suggests that, despite this being prominent in supplier communications, the message is not cutting through with consumers. Encouragingly, fewer people are saying that nothing will motivate them to have a smart meter or smart technology in the future. Levels of interest in low-carbon and renewable energy technologies have increased since June’s survey, with around one-third of respondents saying they would be either extremely or very interested in taking up such tech. However, despite high levels of interest, adoption has been slow, with 80 per cent still stating they do not own any of these low-carbon devices. The picture has been the same in previous surveys. A major barrier to adoption continues to be a lack of knowledge about the technology but cost also plays a major part. As with smart technology, however, the picture among non-adopters is positive, with a significantly smaller proportion than in previous surveys saying nothing would motivate them to purchase low-carbon technology in the future. The survey asked about individual low-carbon technologies and, of these, solar proved the most popular, with 11 per cent of respondents stating that they own solar panels currently. Battery storage came second, with 7 per cent claiming to own some form of on-site battery storage. Electric heat pumps showed the least uptake, with just 4 per cent saying they had adopted this tech. Asked about their reasons for not installing solar panels, a third of participants (35 per cent) said they worry about the costs in the short-term. However, most are willing to adopt this technology in the future if it is most cost-effective or cheaper. There has been a significant decrease in those saying nothing would motivate them to purchase. The story was similar for battery storage. Just over one-third of participants who hadn’t adopted the technology said this was because they didn’t know enough about it. Twenty per cent said it was because of cost, and 17 per cent said it was because they didn’t feel they would need it. These are the same top three reasons as in the previous survey. Again, there has been a significant decline in those saying nothing would motivate them to take up the tech. 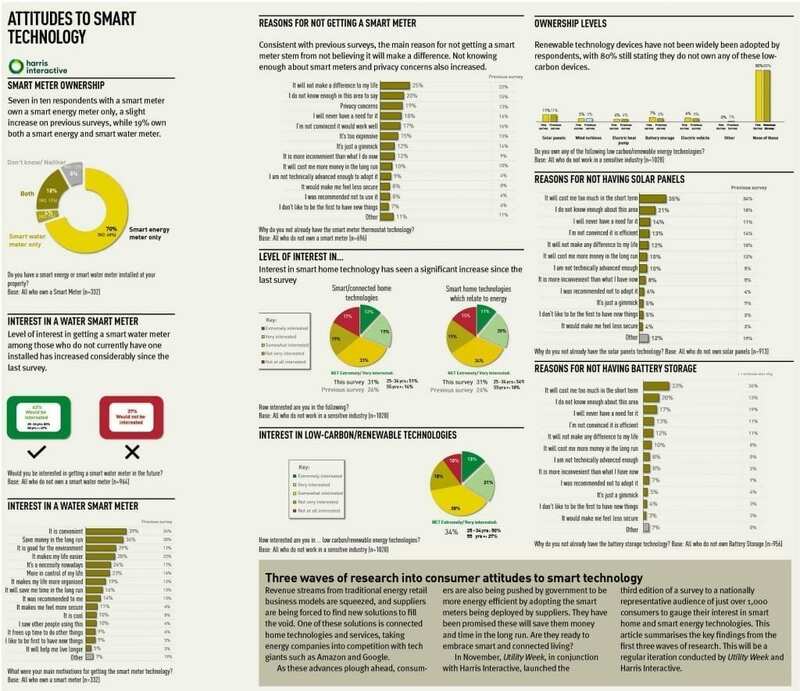 This research clearly shows that consumers are warming to the idea of smart and renewable technology but work still needs to be done to encourage widespread adoption. A lack of knowledge and high prices are increasingly seen as barriers to adoption. Energy companies, therefore, either need to find a way to make such technology more affordable or demonstrate value for money by clearly communicating the return on investment and benefits that people get from having them, and then getting greater cut-through with this message. Until either is achieved, widespread adoption of these technologies is unlikely.